What if somebody finally wrote to his high school alumni bulletin and told...the truth! 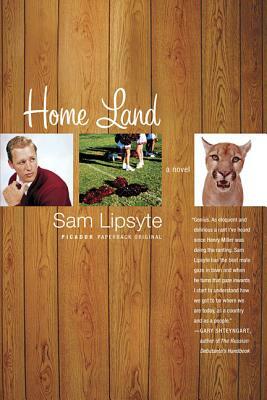 Here is an update from hell, a brilliant work from novelist Sam Lipsyte, whom Jeffrey Eugenides calls "original, devious, and very funny" and of whose first novel Chuck Palahniuk wrote, "I laughed out loud---and I never laugh out loud." The Eastern Valley High School Alumni newsletter, Catamount Notes, is bursting with tales of success: former students include a bankable politician and a famous baseball star, not to mention a major-label recording artist. Then there is the appalling, yet utterly lovable, Lewis Miner, class of '89---a.k.a Teabag---who did not pan out. Home Land is his confession in all its bitter, lovelorn glory. Sam Lipsyte was born in 1968. He is the author of the story collections Venus Drive (named one of the top twenty-five books of its year by the Voice Literary Supplement) and The Fun Parts and three novels: The Ask, The Subject Steve and Home Land, which was a New York Times Notable Book and received the first annual Believer Book Award. He is also the recipient of a Guggenheim fellowship. He lives in New York City and teaches at Columbia University.